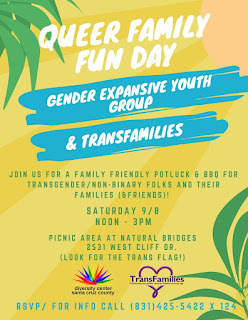 We are joining forces with the Gender Expansive Youth Group at the Diversity Center to hold a family BBQ. Ezra, the trans program director and Jack the leader of the Gender Expansive Youth Group are going to do the heavy lifting. We just need to RSVP and show up. If we want to bring a dish that would be great. 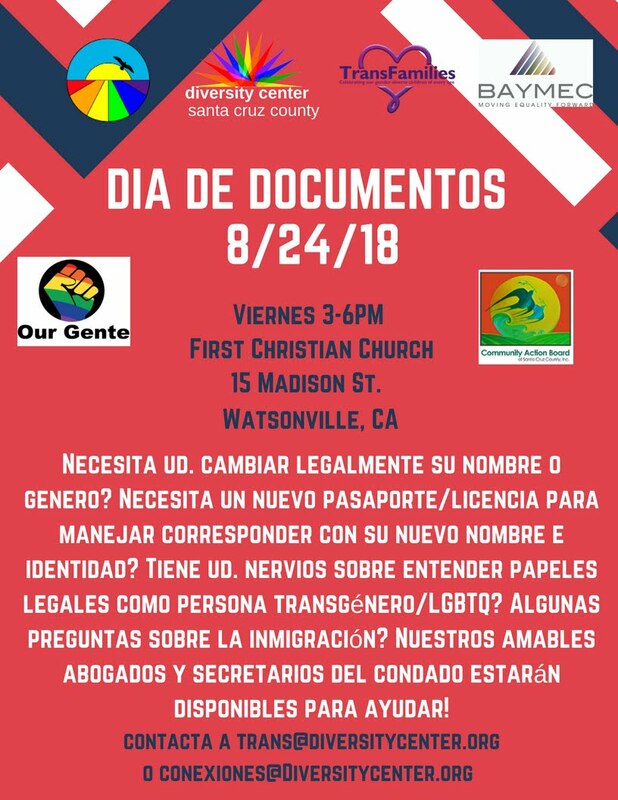 We are co-sponsering a document day in Watsonville. 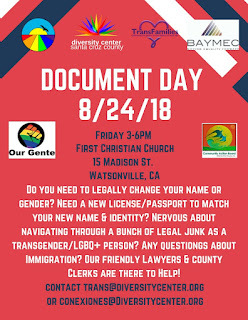 If you need help with changing documents for your child this is an excellent opportunity to get help and direction. Renee Fleming the law librarian from Santa Cruz Superior Court, who has been incredibly helpful to our families, Lisa Cisneros the LGBT Program Director from California Legal Assistance and Dana McRae the Santa Cruz County Attorney will be there to answer questions. This is bi-lingual clinic and help will be available in Spanish. If you are interested in helping out, we always appreciate more hands and this is a great opportunity to share your knowledge that you gained going though the process for your child. 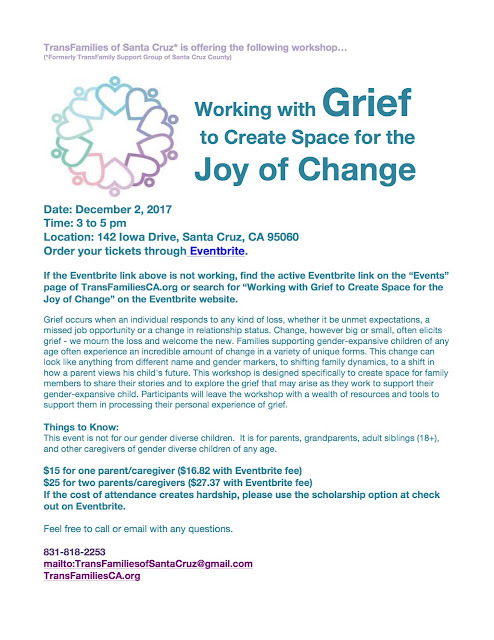 TransFamilies of Santa Cruz is hosting a holiday Party!!! It’s time for the annual family potluck hosted by Kevin and Lisa at their lovely and fun home in Sunnyvale. This well attended, joint event held for Transfamily Support Groups from Santa Clara, Silicon Valley, and Santa Cruz is a great time for our parents and kids to relax and socialize with one another. Kevin and Lisa will once again have their heated swimming pool ready for those kids and adults who would like to frolic and dip. 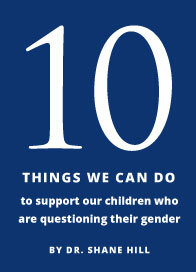 This is a safe bathing suit space which is very exciting for our kids, and, therefore, a big hit with the parents, too. Hamburgers, hotdogs, veggie burgers, buns, condiments, plates, utensils, cups, and beverages, including beer, soda, and juice, are all generously provided. All you need to do is bring a side dish in the form of an appetizer, a salad, or a dessert. Contact Dina Oskiera at 831-818-2253 to get on the guest list and receive further details. When RSVPing by text or voicemail, leave your name, contact information, full name, and the number attending with your group.